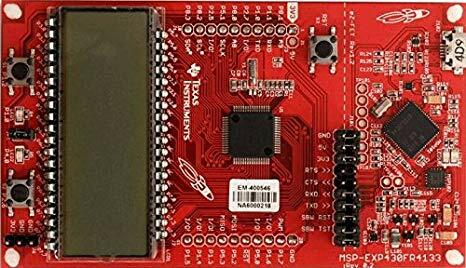 In this example we will take a look at the MSP430FR4133 launchpad from Texas Instruments. There will be a blinky LED example which was written in Code Composer studio. The MSP-EXP430FR4133 LaunchPad development kit contains everything needed to start developing on the MSP430 Ultra-low-power FRAM-based microcontroller platform, including on-board emulation for programming, debugging and energy measurements. The board features on-board buttons and LEDs for quick integration of a simple user interface as well as a Liquid Crystal Display which showcases the integrated driver with flexible software-configurable pins. The MSP430FR4133 device features LCD support with an integrated 10-bit ADC as well as embedded FRAM, a non-volatile memory known for its ultra-low power, high endurance and high speed write access. The program counts to 40,000 while the red LED is on. Then, it turns off the red LED and counts to 40,000 one time before turning the red LED back on and repeating.